I’m happy to share that these two quilts will be showing at PIQF next month! This was inspired by the very loud and colorful wild parrot flock that are often spotted within San Francisco. I am amazed that these escaped family pets have rediscovered their wild roots in our urban landscape. My inspiration for this quilt is my delightful son, who is a college physics major. He enthusiastically shares all that he is learning upon his visits home – including trying to help me understand the basics of physics, and in this case, protons: a positively charged particle that resides within the atomic nucleus. A recent trip with family yielded much inspiration for quilting. I couldn’t wait to get back home to start ripping up fabric strips from my stash to make something! My husband, kids (both home from college for the weekend) and my brother, sister-in-law and nephews had a wonderful weekend hiking around Monterey Bay as well as making a quick trip to the Monterey Aquarium. The colors in the water around the coast are mesmerizing. This is what I’ve started the first afternoon. We’ll see where it goes…. My New Year’s Resolution for 2018 was not to buy any new fabric and to focus on creating with only what I have on hand. I’ve mostly kept to that – and one that fills the bill is this one made from my husband’s shirts. As we were cleaning out our garage he found a bunch of shirts that he planned to give away. I intercepted (note I didn’t BUY anything new) and used them to make this shirt quilt. It’s been quite a project, however! It took a long time to cut up the shirts (lots of good videos on how to dissemble a shirt to get the maximum fabric for reuse.) Then, cutting and piecing to make the best use of the stripes took a long time as well. 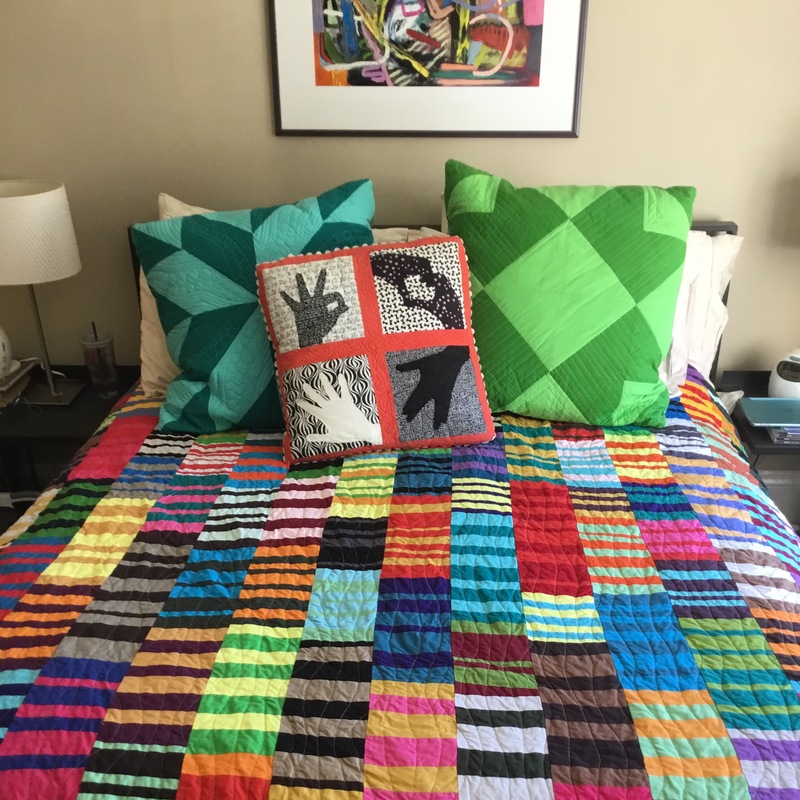 And this quilt in HUUUUGE – the biggest I’ve made yet (a comfortable king bed size – what was I thinking?) I have enough squares leftover for a twin size, I believe. Finally, I started quilting it on the machine outlining the seams, but it looked a mess. 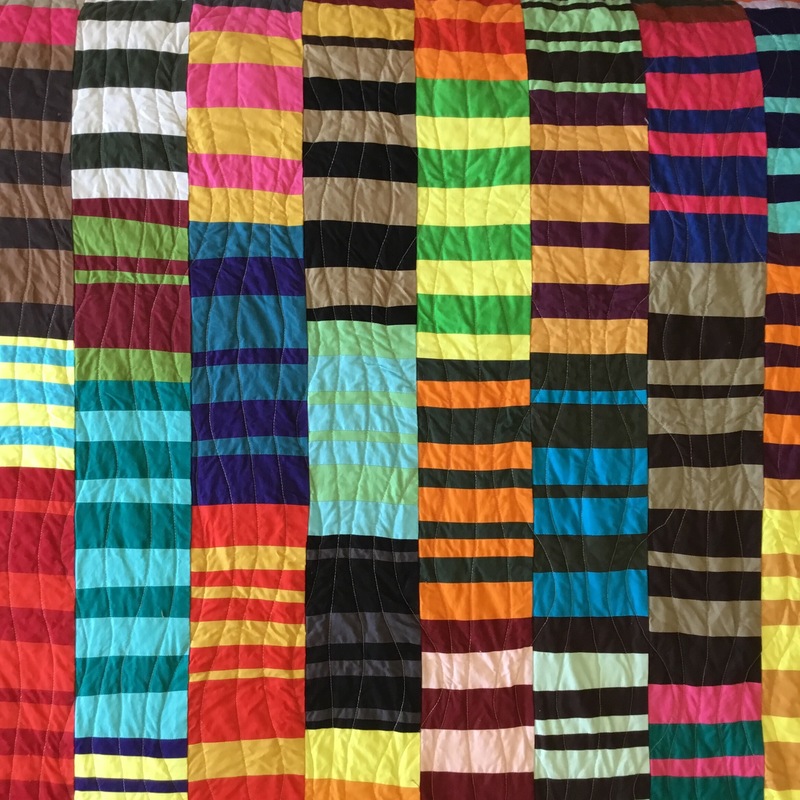 Sooo – I decided to hand-quilt the entire thing. I adore the look, but here we are in July and I’m still only about 1/3 of the way done, despite lots of marathon TV series watching while doing it. In the end, it’ll be worth it and a family treasure, I’m sure.